Leaving Reykjavik puts you in high country pretty quickly. One day we drove up towards Geysir The well maintained asphalt road winds across plains of snow (and refrozen snow melt), as massive ice packs and mountains loom ahead. It's a nice drive. 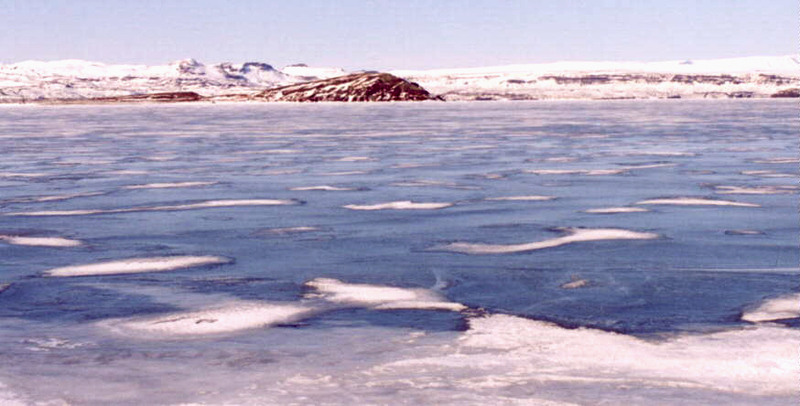 Remnants of snow drifts drying off the frozen surface of a reservoir. The ice keeps a bit of the glacier blue color. 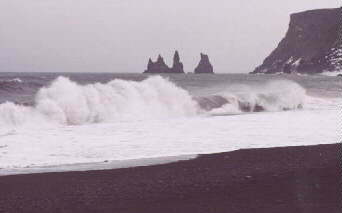 One day was spent driving to Vik, on the southern shore. The drive was interesting as it passed through numerous villages and spectacular landscape. The terrain appears to be an alluvial plain washed down from the mountains. 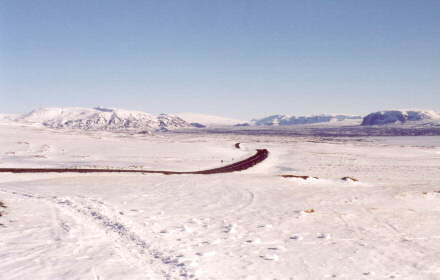 Much snow had melted and refrozen, creating thousands of acres of land covered in few inches of frozen water. Steep cliffs dropped right down to the road in some places, and then the land dropped off to the sea. It was bright and sunny most of the way until we got close to Vik. There, at the last minute, the road ascended into high mountain country, and we found ourselves in clouds and snow. 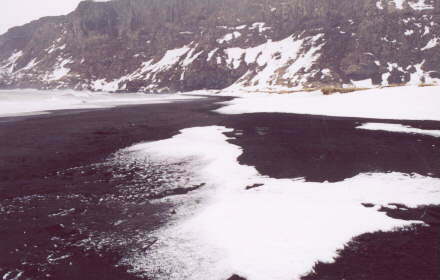 The volcanic black beach near Vik, a bizarre shoreline with unusual rock formations offshore. 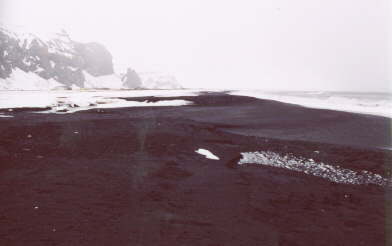 It was very windy and cold, and windpatterned snow drifted across the sand. Light snow was coming down which only added to the unusual ambience of the place. Islands magazine named this one of the ten best beaches in the world not too long ago. I spent one day riding horses. It was bright and clear and about 40-45 degrees. We rode across rolling hills of lava, and except for occasional snowdrifts, the terrain was indistinguishable from Ascension Island. (same origin = same look). 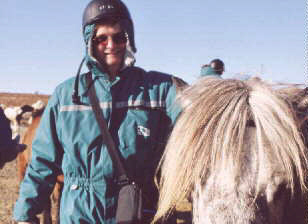 The Icelandic horse is smaller and gentle, but Silver, the one I rode, had a pretty strong will. I was able to get him to do what I wanted, but only after a little bit of 'debate'. They are renowned for their unique gait, which is very smooth. It's smooth alright, but the rapid rotational oscillation of the riders' hips is a bit unexpected. 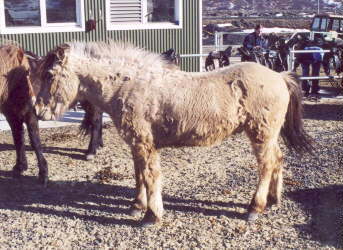 Whenever we stopped to rest, Silver would break up ice in frozen puddles with his hoof and start eating it like grass. They all have thick hides, but this one had rougher coat than most. 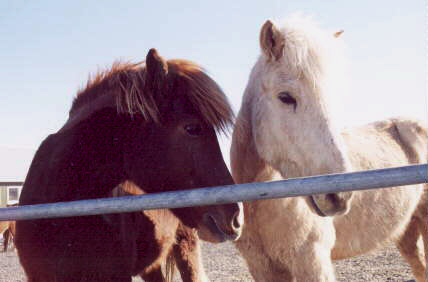 These two approached as I was standing near the corral. They liked the interaction with people and were quite outgoing.